Recently, we blogged about change readiness and the role it plays in business transformation. In this article, we’d like to take a step back and look at how organizational change management (OCM) as a practice can help you overcome some of the tough communications-related challenges that come with transformation. To do this, we’ll draw upon some key learnings from recent OCM training we completed through APMG International. Before jumping into some of the cornerstone concepts, let’s briefly explain what we mean by change management. In the simplest terms, OCM is moving an organization from point A (current state) to point B (future state) using prescribed processes and methodologies. All the while, the focus is on the people affected by the change. It’s an intricate—and at times complicated—process that takes a lot of time, talent and tenacity to pull off. One way to help illustrate the complexities of change management is through the metaphor of metamorphosis of a butterfly. Butterflies meticulously transition through four defined stages of life. First an egg, then larva, then a pupa and eventually they emerge as a beautiful butterfly. To bring this metaphor to life and show how it connects to OCM, let’s do a quick review of entomology. Or for you bug nerds out there, lepidopterology! In the first stage—Egg—a female butterfly lays eggs in tiny clusters on plants. In the second stage—Larva—a tiny caterpillar appears from the egg and begins feeding on nearby plants. It’s during this stage when the caterpillar gorges itself by consuming everything in sight. Next comes the third stage—Pupa—where the caterpillar goes into a protective state and builds a cocoon around itself for safety. Then there’s the fourth and final stage—Butterfly—when an adult butterfly breaks free of the cocoon, spreads its wings and takes flight for the first time. Sound vaguely familiar? 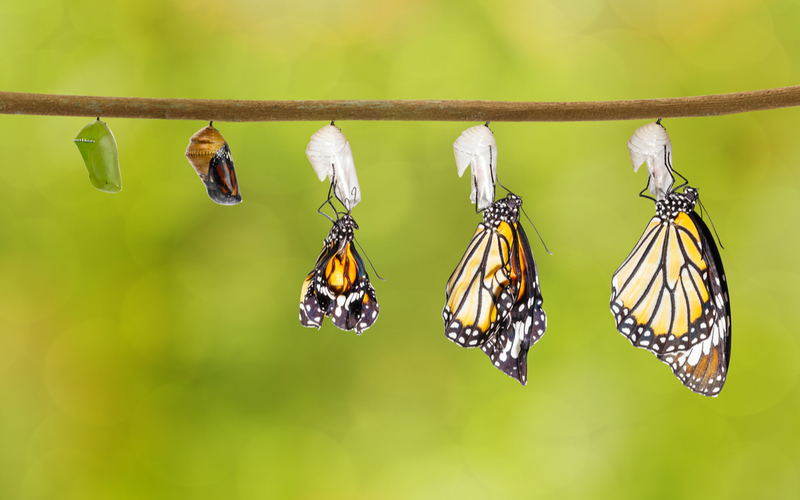 Just like the butterfly’s metamorphosis, change management serves as a mechanism to help organizations successfully transition from one state to another. The Egg stage sort of reminds us of the seeds of change that are planted in an organization. The Larva stage feels a little like the information-gathering phase of a change, in which people are hungry for knowledge and power. The Pupa stage seems like the period during a transition when some folks go into self-preservation mode and rebuff the change. And the Butterfly stage reminds us of how we all feel when we make it to the other side of a business change—hopefully invigorated! When it comes to change, we strongly recommend that communicators begin with the “what.” What exactly is changing? Equally important, what isn’t changing? What role might the individual play before, during and after the change? And finally, what can the individual expect once the transition is complete? Along with the “what,” we encourage leaders to fully explain the “why” and allow for dialogue among staff. Telling people why a change is necessary and ultimately for their benefit can go a long way in helping them connect to the change and be more open to adopting new ways of doing business. As you implement change, remember that every transformation begins at the individual level. And at this stage, it’s very personal for people. It’s important to consider both learning styles and motivating factors as you tailor your communications and training activities to best meet the needs of your staff. Because we’re all wired a little different, it’s good to bring a variety of learning methods to the table. For example, activists prefer on-the-job learning through trial and error, while theorists learn better by attending seminars and doing personal research. At the same time, pragmatists enjoy practical workshops and simulations. And reflectors gain knowledge by watching others do something. The key takeaway here is to acknowledge the various styles and activities and make sure to incorporate all of them into your training plan. This will help people learn new skills quicker and move from a state of unconscious incompetence to one of unconscious competence. For more information on this topic, check out this recent blogpost on managing resistance. In addition to learning styles, other motivating factors come into play during a business change. While you may think things like working conditions and salary are motivators, our experience shows that these can lead to lower job satisfaction and engagement. Research backs this up. Instead, we recommend communicators focus on three main motivators: autonomy, mastery and purpose. Autonomy gives people the freedom they need to try new things and make decisions about the environment in which they work. Mastery feeds people’s desire to do good work and continually seek opportunities for personal development. Purpose is all about giving people the chance to do work that has both meaning and value. Any initiative that brings these three factors into play is more likely to elicit higher engagement and a faster adoption rate. Another concept reinforced by our change management training is that culture plays a major factor in an organization’s ability to achieve success during a transition. In general, there are three agreed-upon levels of culture, as outlined by organizational development guru Dr. Edgar Schein. The first level of organizational culture is visible artifacts, such as who gets the posh corner office or the best weeks of the year off for vacation. The second level is norms and values that help define what is considered “right” or “wrong” or “good” or “bad.” The third level is basic assumptions that are rarely spoken yet reinforce many of the norms and values. It’s important early on to shed light on these factors and discuss their relevancy in the future state. This can be challenging for some organizations because, as Dr. Schein points out, the strands of culture can run deep, particularly for senior leaders and long-time employees. At IronStrike, we often work with leaders to identify the various aspects of culture and vet whether they can inhibit change. Sometimes they’re the by-product of culture. Other times, they’re more tied to the organization’s climate. We had the pleasure of attending the Ultimate Culture Conference hosted by Human Synergistics International last year, and there was a lot of talk about the difference between culture and climate. According to Dr. Schein and his colleagues, climate is more changeable than culture. As we noted in our highlights reel from the conference, culture is often invisible, latent and difficult to quantify. Climate, though, is quite the opposite. The gamechanger is in how you support leaders in changing the climate to better reflect the desired culture. Our change management training echoed this by acknowledging that everyday communications should be developed so that they genuinely support your culture. Organizations experiencing profound change have many challenges that staff need support in overcoming. In the early stages, team members may feel overwhelmed and unable to see how the change will benefit them. They may also express anxiety about their job security, insufficient coaching or learning opportunities, loss of control and even trust. For these reasons, it’s important to communicate a clear vision for change right up front. Most importantly, ensure that your leadership speaks with one voice about the vision and the desired outcomes. This isn’t to say that you need to share the exact same message, word-for-word, with every audience. A single statement may not be relevant for everyone. Instead, you may need to develop a core message that is then represented slightly different for various audiences. We recommend involving your front-line managers in deciding how best to share messages with their individual teams. It’s also crucial that your executive team, sponsors and other change agents maintain a high profile before, during and after the transition. For change to be successful, senior leaders must not only talk the talk, but walk the walk. So, we encourage leaders to stand firm on the non-negotiables, while still seeking out every opportunity to discuss the change and gather feedback from staff. The end goal is to achieve a critical mass of support and ultimately shift the organization in favor of the change. One of the best takeaways from our change management training was that all stakeholders matter–whether you want them to or not! You don’t get to decide who your stakeholders are. Quite simply, a stakeholder is anyone who has an interest in the change or its outcomes. Anyone! It could be someone directly affected by the change. Or someone who perceives that they’ll be affected. They might take a positive, negative or neutral position on the change. And they can be internal or external. Our favorite point from this concept was, “You can forget important stakeholders, but they won’t forget you.” Isn’t that the truth! You can ensure you have everyone accounted for by including stakeholder mapping in your change management plan. The first step is to name your stakeholders. We like to do this through more structured forms of brainstorming like rapid listing exercises and group mind maps. In rapid listing, you begin by having individuals write down all the stakeholders they can think of. Then you have them pair up and compare lists. From there, you have them work in groups of four. Eventually, you bring everyone together and review one complete list. This method helps you name stakeholders that you might otherwise overlook. Group mind maps are similar, in that they allow for individual think time and then structured dialogue where you blend everyone’s ideas and input. This can be a creative way to get the juices flowing, not just in stakeholder mapping, but also in other areas of business. Once you have your stakeholders categorized, we encourage you to think about the level of engagement each will need. Mayfield again offers a good mechanism for this, called a stakeholder radar. In this radar, you classify each group as Vital, Necessary, Good and Courtesy—or VNGC. Think of it as a bullseye with Vital in the center. You can even overlay the CPIG model with the stakeholder radar to quickly see where the bulk of your stakeholders fall. Doing this will help inform decisions about how much and when to communicate with people about the change. This approach takes more effort, but it goes a long way in building trust and rapport with people. Always keep the focus on people, particularly those most affected. Share information as soon as you can; don’t wait until you have every detail in place. Appeal to people’s heart and minds using symbols, metaphors and storytelling. Keep messages short, and use an appropriate tone, style and medium. Make information clear and easily accessible; be sure to tell people where they can find more information or ask questions. Include specifics on actions you want people to take, and by when. Engage people to develop a shared understanding and gather feedback. During a business transformation, your teams need to understand why the change is necessary, what is or isn’t changing, how it will affect them personally, what role they can play during and after the change, and what they can expect when they get to the other side. This level of detail needs a laser focus on developing a solid change management strategy and the internal communications to support it. Sort of like the carefully planned and executed metamorphosis of butterflies in their quest to embrace a bold new world! Not ready to go it alone? We’re here to help.